This matchup pits the NFLs 2nd ranked defense vs the 2nd ranked offense. 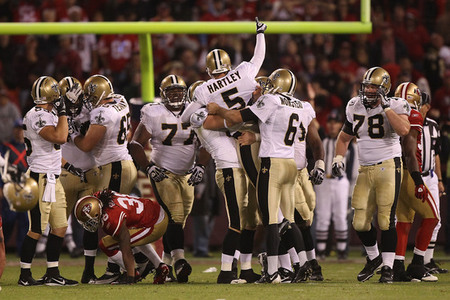 The Saints have been playing the best 2nd half football in the NFL, while the 49ers seemed to struggle down the stretch. While Alex Smith has been playing better than he has ever been before, this will be a true test. Smith threw for 17 touchdowns and only 5 interceptions. But his counterpart, Drew Brees has had the best year a quarterback can have, setting an NFL record with 5,476 passing yards, throwing 46 touchdowns and only 14 interceptions. But going against the defense that loves to take the ball away, this will be a challenge. The Saints are on the road in this game, where they are 0-4 in franchise history in playoff road games. However this year, it shall end, as the Saints will move to the NFC Championship game for a second time in three years. In January 2002, this New England Patriots franchise began their quest to become one of the most prolific NFL dynasties as they edged out the Oakland Raiders to advance to the AFC Championship game and eventually winning the Super Bowl. It was a Saturday night, where snow poured heavily into Foxboro. Ten years later, the Patriots are faced with a quarterback who possess a magic that allowed him to defeat the Pittsburgh Steelers in overtime. But for Tim Tebow and the Denver Broncos, the tasks gets harder. When the two teams met earlier this year, the Broncos took an early lead, only to lose by 18. If the Broncos are going to win, they are need to expose the bad passing defense of the Patriots. Unless Tebow has another 316 yards in him, the Patriots will win again in a dominant fashion. When these two teams faced each other thinks were different. Texans wide receiver Andre Johnson was sidelined due to hamstring injury. Matt Shaub was also the starting quarterback. This Sunday it will be T.J. Yates. Now while both teams are evenly matched, it will come down to the play of the quarterback. Ravens quarterback Joe Flacco will be playing with a chip on his shoulder, especially since there is question as to whether he can perform in the playoffs. But the Ravens are home for the first time since 2006 and they will be playing at a high level. Sal Palanatonio said on Tha Best Damn Show In Radio, that this will be the most evenly matched game. The Ravens win this one in a nail biter. The Giants struggled in the second half of the season, however, once they entered the playoffs, they became dangerous. A week ago they hammered the Atlanta Falcons, 24-2. This week the task doubles in difficulty. They must go into Lambeau field. The last time Eli Manning went in there during the playoffs, they won in overtime. They also had Brett Farve who liked to throw the ball to the opposing team more than his own. With Aaron Rodgers playing like he is not human, the Giants have their handful and it will be difficult for them to overcome the odds. Packers win this one in a close one.